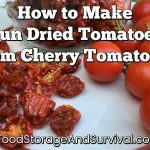 Our friends at CampingSurvival.com have teamed up with us to bring you this fantastic giveaway. Having clean water in a disaster is one of your top priorities, and a Berkey water filter makes it so easy. Berkey filters are gravity fed, so there is no extra time or energy expended pumping to get clean water. Just fill the top reservoir, and wait while the water filters into the bottom reservoir, clean and ready to drink! And there’s no need to save it for an emergency. With their stainless steel housing, the Berkey filter will look fantastic on your counter every day of the year. 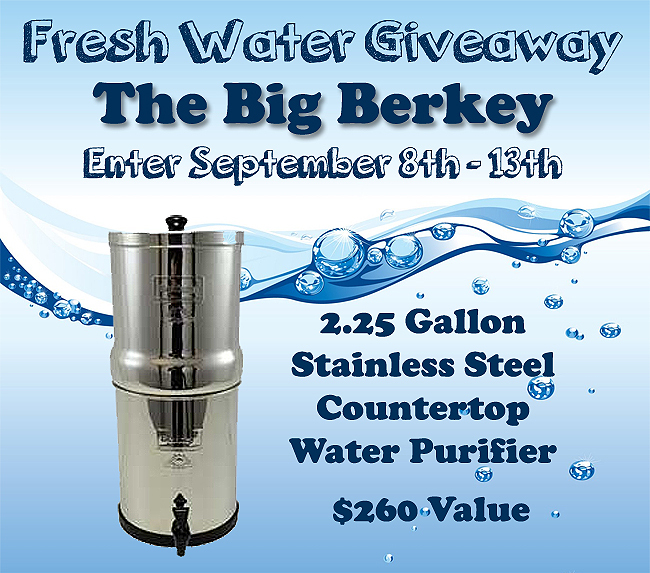 And this week we are giving away one Big Berkey Water Purifier! This Big Berkey Water Purifier Giveaway is open to any resident who is 18 years of age or older who lives in one of the 48 US Contiguous States. This giveaway starts on Monday, Sept. 8th at 5:00 am (MDT) and ends on Saturday, Sept. 13th at 5:00 pm (MDT). The winner will be notified by email and will have 24 hours to respond. If we do not hear back from said winner in the designated time period of 24 hours we will choose another winner and they will have 24 hours to respond from the time the notification email is sent. Please check your SPAM email folders. Good luck to everyone! Let’s be prepared for the unexpected!